A snowsnake 1.83 meters long (6 ft) or mudcat 1.21 meters long (4 ft) can take up to eight years to prepare in order ensure the proper shape and hardening of the wood which is able to withstand the wet and icy conditions. The track is made by piling snow about 76 centimeters high (30 inches) and gradually slopes to ground level most tracks are about a mile long. A log is used to make a groove along the top of the track for the snowsnakes to travel. The teams consist of a Shiner, a Thrower and a Marker. The Shiner is the one who prepares the snowsnake according to the weather conditions. The Thrower stands in the pitch hole, takes a running start and throws the snake onto the track. Sometimes the Shiner can also be the one who marks the distance the snowsnake has traveled. Records show snowsnakes traveling up to 2.4 kilometers (one and a half miles). 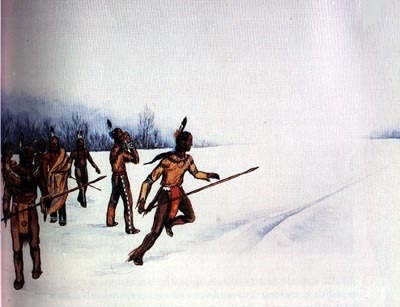 Snowsnake tournaments are still played today.